Welcome to FreeThoughtPedia.com! Today is Friday, April 26, 2019. We now feature 2,550 pages, 702 articles and 1,187 files. NOTICE: For the next few weeks, user registrations and page editing will be temporarily disabled. We've had a large amount of spam-bots attempt to create accounts and junk up the content so we'll be making some changes to fix this and then un-locking user registration. If you want an account created in the meantime, use the contact link to let us know. Thanks for your patience and understanding! 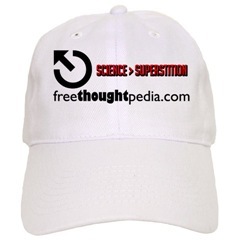 FreeThoughtPedia.com was launched to provide a central repository for resources relating to debate and discussion on a wide variety of issues surrounding the critical thinking movement, including Religion, Atheism, Science, Debate Techniques and more. 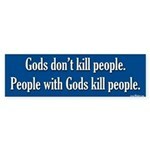 We even welcome theists here as long as you behave yourselves and don't vandalize our Wiki. Would you like to contribute to our online resource? 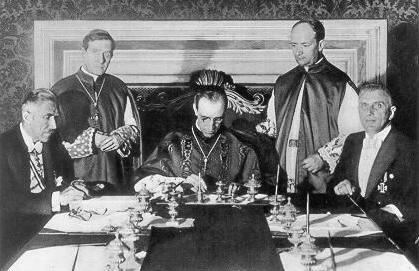 The Concordat between the Vatican and the Nazis, Cardinal Secretary of State, Eugenio Pacelli (later to become Pope Pius XII) signs the Concordat between Nazi Germany and the Vatican at a formal ceremony in Rome on 20 July 1933. Nazi Vice-Chancellor Franz von Papen sits at the left, Pacelli in the middle, and the Rudolf Buttmann sits at the right. The Concordat effectively legitimized Hitler and the Nazi government to the eyes of Catholicism, Christianity, and the world. New to all of this? Start with Why atheists care about religion and Introduction To Religion. Theological Criticisms - An overview of various arguments against theism in general and specific beliefs and scripture. 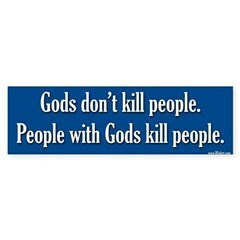 Theists Gone Wild - Sometimes theists are so misguided it can be perceived as amusing, in a very sad sort of way. Here's a collection of videos. Humor - The lighter side of irrationality. 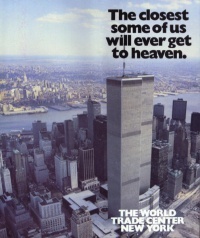 Actual promotional flyer for the WTC in the 1980s. In a world without religion, these two buildings would still be standing. 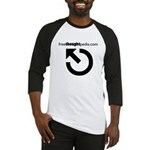 Freethinkers - Our role call of notable online active freethinkers. Also see Famous atheists. Conversations - Are you a theist and want to comment? This is the page from which to do so. FreeThoughtPedia is not looking to encroach into the area of Wikipedia. We want to focus mostly on common arguments, apologetic debunking, illumination of logical fallacies, interpretation and analysis of dogma & scripture, science as it relates to critical thinking arguments, and as simplistic an overview as possible on the various types of religion and world views currently in play. We welcome and encourage people to add and improve the content on FreeThoughtPedia. Please take a look at our Editorial guidelines and if you're new to Wiki, see How to create and edit pages. This page was last modified on 14 August 2011, at 14:38.